Tormek is having a giveaway! Tormek is giving away a T4 machine, with the winner to be announced next weekend and our readers have a chance to win it! Follow Affinity Tool (@AffinityTool) and Stumpy Nubs (@StumpyNubs) on Twitter. Then subscribe to Stumpy’s You Tube Channel and watch Stumpy’s YouTube program on 2/7/15 (this Saturday). 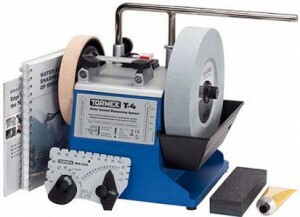 If you do these things you will be entered into a drawing for a Free Tormek T4 giveaway! The winner will be announced the weekend of February 14th. There is no cost to enter the drawing. 2015 is well underway here at Highland Woodworking and we’ve got a great new issue of Wood News Online. Project Idea: Tippmann Boss Wooden Table– A Tippmann Boss Sewing Machine requires a very sturdy surface, so Arthur Stevenson decided to build his own table specifically for his Tippmann Boss. Building an Electric Bass Guitar: Final Details– Lee Laird has spent the past few months chronicling the build of his electric bass and in this final segment he discusses installing the strings and plugs, adding the finish, and more. Show Us Your Shop– Richard Korte has a beautiful 28’x34′ workshop in Olympia, WA, where he builds wooden boats and a variety of other projects. Show Us Your Woodworking– Michael Sweet is a self-proclaimed hoarder of wood that he uses to create a variety of woodworking projects including detailed dollhouses, games, portraits, and ornaments. Show Us Your Carving– Richard Cheek, who we featured in our May 2012 issue of Wood News, is back with several more detailed carvings. The Down to Earth Woodworker– This month Steve discusses the Six Degrees of Woodworking (and how every conversation can eventually lead to woodworking), his outlook for the 2015 woodworking year, a test between wax paper and freezer paper and which one works better for the workshop, his new purpose-built shop storage series, and his upcoming visit to Highland Woodworking. Two Minute Safety Tip– Raymond Randall has contributed a follow-up to the November 2014 Safety Tip on adjusting bandsaw height by suggesting to make sure the blade is no longer moving before touching it. Tips From-Sticks-In-The-Mud-Woodshop– Tack rags and plastic bags, Jim has tips on how these two things can be reused and recycled within your shop. Q:A Ask the Staff– Bob asked our staff if you need to remove the iron from wood-bodied planes when you’re not using them. Check out the answer here. We’ve also got a look back at the best tool reviews of 2014, a book review on Beautiful Boxes, and a variety of tool specials and discounts for the month of January! All of this and more in our January 2015 issue of Wood News Online. 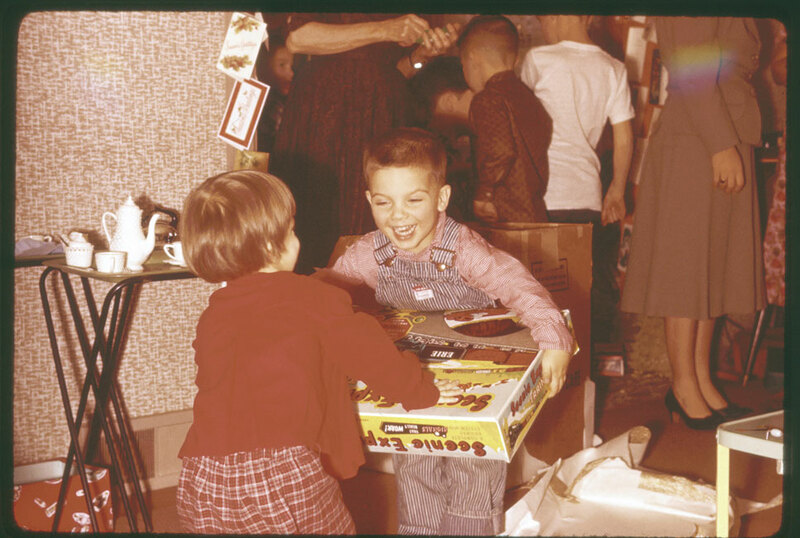 Every year at Christmas time our Grandpas were busy in the shop. Thinking about that, how does a Grandpa approach Christmas time and presents? How can you try to treat all your grandkids fairly? Do you just make multiple copies of everything? Do you try and knock it out of the park with an heirloom every Christmas? Over time, Grandpa R came up with some creative ways to deal with this. Ken and I think there are some tips here as we all approach Christmas. We would love feedback from you, our readers, on this topic. 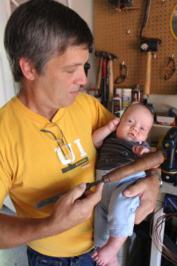 What handmade gifts did you get from your woodworking grandparents as kids? Do you make gifts for your own kids and grandkids? Add your thoughts to the comments below. The holiday season is here and with Black Friday, Small Business Saturday, Cyber Monday, and Thankful Tuesday now past us…it is now time for our brand new December 2014 Issue of Wood News Online. Every December we publish our Holiday Gift Guide within Wood News! This month we’ve got some great gift ideas from books to tools and everything in between. Take a look and don’t forget to get your order in before Friday, December 19th to get it under the tree for Christmas! Hockey season is upon us and we came across a really cool project submitted by Dan Zehner who creates sitting benches out of broken hockey sticks. 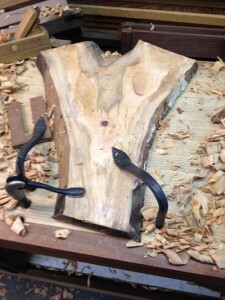 Read how Dan collects the sticks and then gets them prepped and ready for bench making material! We’ve also got updates on a few other projects we’ve been tracking. Scott Stahl has finally finished building his Sawbo Workbench. And Lee Laird is just about to finish up the build of his Electric Bass Guitar with the addition of the frets, bridge, and saddles. Steve Johnson, the Down to Earth Woodworker shares a variety of woodworking knowledge this month with several projects he has going, as well as a head to head product showdown between two types of paper towels. We’ve also got reviews of Ron Hock’s The Perfect Edge and a tool review of the Micro-Jig GRR-Rip Block. And as a bonus we’ve got TWO episodes of our web TV show The Highland Woodworker, including a special Holiday Tool Show featuring several of our Highland Woodworking employees discussing their favorite products. Take a break and read all of this and more in our latest issue of Wood News Online! Why did I need a “Roubo Frame Saw”? A continuation of Adrian Burleigh ‘s Show Us Your Woodworking column from our December 2014 issue of Wood News Online. This endeavor all started when my neighbor decided to cut down his 80+ year old mahogany tree. It was early one Saturday morning that I was roused from my morning cup of Joe, the growl of chainsaws breaking the serenity of the neighborhood. My neighbor, although well intentioned, decided that this was the day to make this “Specimen” tree into firewood. He was tired of the litter from the leaves, seed pods, and sap messing up the front of his house and adding to the cleaning chores of keeping his truck immaculate. I think deep down he was afraid of the tree and hurricanes making that tree into a monster. My concerns for preserving this majestic wonder fell on defiant ears of my neighbor and his co-conspirator, who was also the provider of questionable timbering skills. I then asked just how they planned to tackle this formidable job of felling and bucking a 48 inch diameter hardwood giant. Their reply was “we are gonna cut it from the top down”. Yea RIGHT? The canopy is only about 40 or 50 feet up there. I figured 911 was somewhere in the near future. When I inquired if he had a permit to remove it from the right of way, his attitude quickly became brisk as I was now the “nosey neighbor” and very unwanted unless I decided to lend a hand in the crime. After smoothing his feathers for a minute or two I reminded him that this tree survived numerous hurricanes even since “Andrew” in 1992 without much damage and that it sure would be a shame to lose the only good shade tree on the West side of his house. I also asked him how he was planning to remove the stump. It now was looking to be a somewhat more expensive addition to the unforeseen scope in his plan. I then gave him a conservative estimate as I am a retired building contractor, along with a quick mention of the possibility of being tagged by the local code enforcement officials, who are ever present in our fair county of South Dade Florida. Also a secondary mention to the stir that would be brought on by our Department of Environmental Resources Management (DERM). They would most certainly require mitigation if the required permits were to be issued. More cost and aggravation. He was also not aware that I have been the roadway inspector for a local Civil Engineering firm for the past ten years and that I regularly deal in this type of problem. I digress. How things do get complicated. I then hinted that maybe he would be wiser to consider the size and cost of this enterprise. Noting it might be easier to just trim it a bit and love it a little more for its majestic beauty. Now that he was aware he owned a specimen mahogany tree of great value on his property, that won the debate. I even offered to haul off the heavy cuttings. This is where the plot thickens, and turns into my next adventure in woodworking. The smallest limbs trimmed from this behemoth were over 8” in diameter and the largest crotch sections were well over 20” in width. My little 14” band saw was out-sized for most of this timber. How was I to manage these logs of nice mahogany into workable boards? Portable saw mills are very scarce in South Florida. Not much interest yet in making use of the local urban tree fall. Although I may spark an interest if this article takes off. My attempts to find a local sawyer to slice the beautiful crotch sections were futile, and slicing it with a large rented chainsaw was out of the question with too much waste in all respects. Besides the fact of not be able to afford the mobilization cost to have them come to me. Conclusion, do it myself. In the way it was done before industrialization. 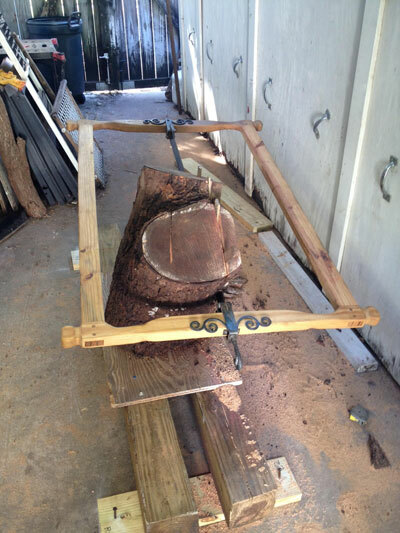 So I proceeded to make a large frame saw, the hand tool to get the job done. I got the idea from Adam Cherubini’s Arts and Mysteries blog and the design from the Renaissance Woodworker. My saw is very much like theirs except just a little wider with some different shaping for the grip. The guide bar is made of white oak with yellow pine for the rest of the frame. Hardware was made by Artisan Iron Designs and the blade blank is from Blackburn Tools. This one tool can be the answer to the complaint of many overweight woodworkers. One hour of working this beast a day will put the tone back into your saddle for sure. It takes some practice but with steady concentration and determination one can, alone, produce usable lumber from wild giants. I was able to make a slice in a 30″ wide crotch section log that was about 36″ long in about an hour, and a couple beers later. Great workout all around – legs, shoulders, back, stomach and forearms. I highly recommend it for anyone who really wants to get that special piece of timber and lose a few pounds quietly in one’s own backyard. Why are wood bench plans that I have seen not over 5 feet long?? KEN: Well, I’m still a newbie grandpa myself, with just a shim and a shaving’s head start. We may have to put our heads together on this. We would love feedback from readers on this topic. How were you impacted by your grandpa in the workshop? What do you see as your responsibility to pass on the love of the craft? Add your thoughts to the comments below.